Our 2016-2017 U.S. Bank Broadway Series begins with A GENTLEMAN’S GUIDE TO LOVE & MURDER! 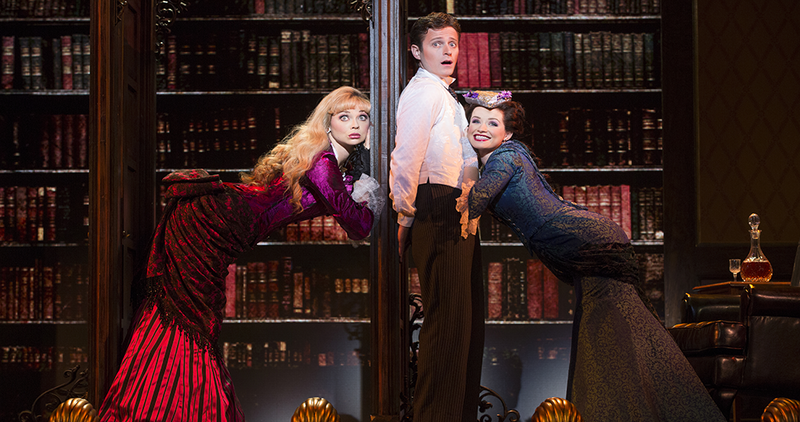 Winner of the 2014 Tony Award® for Best Musical, GENTLEMAN’S GUIDE has received earned unanimous raves from critics and the show is proof that getting away with murder can be so much fun! Don’t miss the knock-‘em-dead hit show at the Fabulous Fox September 13-25. Here’s a guide to help you get to know the show and what makes it fabulous! GENTLEMAN’S GUIDE tells the story of Monty Navarro, a young man, born with ambition but no station, who is searching for a better life. When he learns that he is the distant heir to the D'Ysquith family fortune, Monty begins to seek out the seven family members who come before him in the line of succession, and each family member meets their untimely death soon after. All the while, Monty has to juggle his mistress (she’s after more than just love), his fiancée (she’s his cousin but who’s keeping track? ), and the constant threat of landing behind bars! The show takes place in the Edwardian period in Great Britain, a time when family and fortune were essential for success. GENTLEMAN’S GUIDE captures the mood of the era with elaborate set pieces, including Highhurst Castle, ancestral home of the D’Ysquith family. Based on the 1907 novel Israel Rank: The Autobiography of a Criminal by Roy Horniman, GENTLEMAN’S GUIDE uses an English music hall performance style that is perfect for this “adorably wicked show” (Variety). GENTLEMAN’S GUIDE is filled with hilarious songs that capture the spirit of the show! Written by Robert L. Freedman and Steven Lutvak, the songs support the story and incorporate the operetta style of a Gilbert and Sullivan performance. One showstopper is the lively number the Broadway cast performed at the 2014 Tony Awards, “I’ve Decided to Marry You”, where Monty’s mistress and fiancée both confess their love. The Hollywood Reporter raves, “GENTLEMAN’S GUIDE RESTORES OUR FAITH IN MUSICAL COMEDY” and The New York Times cheers, “IT WILL LIFT THE HEARTS OF ALL THOSE WHO’VE BEEN PINING FOR WHAT SOMETIMES SEEMS A LOST ART FORM.” Kindly get your tickets now for the musical that will have you dying with laughter at the Fox this fall! Tickets on sale now at Metrotix.com, at the Fox Box Office or call 314-534-1111.